This past week we loaded the baby into the car and drove off to San Francisco. It's about a ten hour trip, so we broke it up into two days, stopping halfway through in Yreka where my mother's aunt lives. My great aunt. LE's great-great aunt. It astounds me that there's a great-great aunt in his life. Despite a serious stroke a couple years back, our aunt is surprisingly spry. 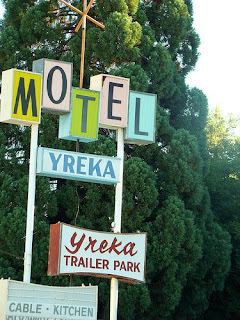 Yreka is, well, a little frightening. One thing that was frightening was the smoke from the nearby California wildfires that everyone there just seemed to be ignoring. 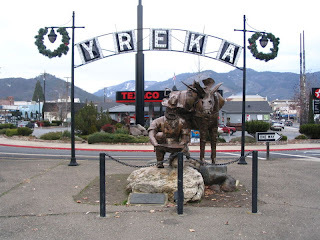 The name 'Yreka' (pronounced 'why-reeka') is a little frightening too, as though the poor town got stuck with an unfortunate misspelling, then had to change to an unfortunate mispronunciation as well, in order to differentiate itself from the more accurately spelled Eureka, California. Yreka is little more than a depressed burg full of under-employed rednecks, old people, and Christians (of the variety who like threatening billboards and bumper stickers like "Jesus Christ: He's our Lord, not a swear word"). Some people seem to be all three of those. On the way back from San Francisco, we had breakfast in Yreka at a place called Grandma's House. The outside of the restaurant was decorated like a gingerbread house, I suppose in a misdirected attempt to be cute, where the decorators forgot that inside the original fairytale gingerbread house dwelt a witch who lured children inside so she could kill them and eat them. If there was a witch inside Grandma's House, she was clearly mad. It looked like someone squeezed a chintz monster until he vomited several layers of floral prints, lace, and wide-eyed kittens onto every surface. Everything was for sale, including an entire shelf of clocks shaped like fat little animals whose tails wagged with the ticking, paintings of a fair-haired, flowing robed Jesus looking up at the sky with dewy spaniel eyes, and embroidered tapestries with inspirational messages. A bookshelf was loaded with titles like Emergency Prayers and Learning to Fly: One Girl's Inspirational Journey With God. I won't even tell you what the bathroom was like. I do love it though, that there are towns in America with places like Grandma's House, and how the locals seem to be completely unconscious of how bizarre it is. The locals seemed to find the restaurant charming, well-decorated, and not at all out of place in reality. And in Grandma's defense, they served up a lovely breakfast and everyone there was just as nice and cheerful as could be. And Yreka also sports this place, which I found just priceless. One thing I love to do while riding in the car is play with the radio. There are very few people I know who will put up with this crap, and my mom is one of them. BE hates it. He lets me change the station maybe two times, then it lands on a song he likes which I usually hate and he won't let me play with it anymore. He's one of those guys who claims to despise Ibrahim Tatlises and his ilk, yet can't pass up the chance to hear one of those songs and he sings along, waving one arm lovingly with the music. BE's car has a feature which prevents me from playing much with the radio-- the power to control the station with the same stick that controls the windshield wipers. In any case, playing with the radio in Turkey is unrewarding because of the lack of variety. It's gotten worse since Radyo Nostalji sold out to some stupid company that changed it from foreign classics to Turkish "classics," as though anyone misses Turkish Pop from five years ago. It is this same company, I'm told, that infused MTV with Turkish videos, as though there weren't already enough Turkish video stations on TV. But enough with the asides. My mom lets me play with the radio, and in America I hardly even have to play with it very much before I find a Classic Rock station I'm happy to camp on for awhile. This was all well and good until we got near Grant's Pass, Oregon, in the mountains near the border. The signal got so bad that even I wasn't willing to put up with it long enough for one more Led Zeppelin song, so I hit the seek button. At that point, only four stations were available: two Country/Western stations (one that billed itself as "Not your parents' country music" and I thought, "Dang, no Willie Nelson?") and two Christian stations. Not the kind like in Portland where they play Christian music that's just second-rate rock or pop with Christian-ish lyrics. They were the kind where they let some lunatic rant on about Hell and fornication and the Sodomites. Before my mom got mad and switched off the radio (her Baptist upbringing gives her a short tolerance for these screeds), a guy was going on about the Antichrist. He was using a lot of words I knew, interspersed with quotes from scripture, but what he was saying made no sense. It was about the Middle East and the West and the coming of the Antichrist as foretold in the Book of Revelation. I figured because we're in America in these post-9/11 times (American shorthand for "We're wary of Muslims and the Terrorists are out to get us all"), the Antichrist this man was talking about must have been in the shadowy Middle East. But since I've been in Turkey for so long I'm also used to hearing the idea that the Antichrist is from the decadent West. From what the guy on the radio was saying, I really couldn't be sure which from direction I should be watching for the Antichrist. He used lots of words and phrases that didn't exactly go together and one would have to be very well versed in cipherin' (as opposed to literate) to figure it all out. In the end, I asked my mom what the Antichrist is because I'm pretty sure it's not the devil, and she said she didn't know because the Baptists didn't talk about that so much in her day. As for the wildfires in California, the smoke was unbelievable. Twenty minutes into the smoke, we had headaches and our eyes and noses were burning. For two days, LE looked like he'd just been crying. It was like sitting downwind from a campfire and no amount of hating white rabbits would make it go away. I felt so sorry for the people who live in that, especially the high school kids in Redding out running around and doing push-ups for summer football training. Any sane, responsible educator of kids would, I should think, cancel the training or at least move it to the gym. But I guess in Redding (which is like a larger version of Yreka), high school football is just too damned important to alter the training schedule just because of a little smoke. I'll bet in Redding there's a lot of gambling on high school football just out of a lack of anything better to do. And who knows? Maybe training in the smoke gives the team some kind of advantage, like their lungs will be that much more powerful in smoke-free air. There are a lot of things I've missed out on being away from America for so long. For example, I've never seen Arnold Schwarzenegger behaving in his capacity as governor of California. But there he was on the news, old Arnie the Terminator (a joke I'm sure has been done to death here, but I haven't been around for that either), talking about the wildfires. I can't believe anyone voted for him in seriousness. It's surreal. At least Jesse Ventura had a nice down-home way about him. With Arnold, I just kept thinking, "Nice night for a walk, eh?" San Francisco was San Francisco. Exactly the same and sort of different from when I lived there about fifteen years ago. We were only there for a short time-- enough for two wonderful Italian meals at one restaurant that has changed and one that's exactly the same, plus some shopping where we bought very little because even though the stores in downtown are way more fabulous than the ones in Oregon, they have more or less the same stuff, but Oregon has no sales tax. Still, LE came out of it with some very dapper things, and I got a pair of shoes on sale. Then we had lunch with my uncle. My uncle is a little intense but I haven't seen him in awhile and it was nice seeing someone who was in my childhood. He gave LE a beautiful handmade print he'd done himself that I think will be a great thing for LE to have in his pre-verbal, pre-memory consciousness. Then it was back on the road for the same endless drive through the same places. LE was again quite the little travel-trooper. When we got home my dad made Manhattans and I remembered, like I've done so many times since I've been here, why it's so very, very good to be at home. Heh, you've have met and talked to some of our politically active 'devout' people and still don't know who the Antichrist was? That propaganda is not really a well kept secret. Hint: saying that outright might be illegal here. (It is Deccal in Muslim terminology). There's also this Gog and Magog business (Yecuc Mecuc in Islam). For those, I'll give you a search. Well, well! You learn something every day.